Bhubaneswar: KIIT University inked a memorandum of understanding (MoU) with the International Association of Universities (IAU) to internationalise the education system in KIIT on March 15, 2017. The agreement was signed by Ms. Eva Egron-Polak, Executive Director, International Universities Bureau & Secretary General, IAU and Prof. Achyuta Samanta, Founder, KIIT & KISS in the presence of His Excellency Mr. Mirzosharif A. Jalolov, Ambassador of Tajikistan to India and Prof. Sasmita Samanta, Registrar, KIIT. KIIT is the first Indian university to sign such MoU with IAU. 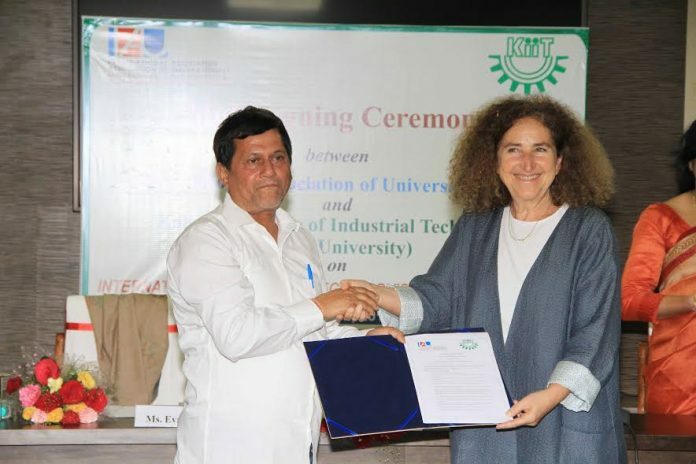 “It is a significant step that will provide impetus to the ongoing process of internationalization of higher education at KIIT”, the founder of KIIT said after signing the MoU. Based in Paris and located at the UNESCO headquarters, IAU is an association of more than 650 higher education institutions and organizations in some 130 countries. It was founded in 1950 to enhance global cooperation on higher education. The association cooperates with a vast network of international, regional and national bodies of higher education. It provides a wide variety of services to member institutions and organizations to internationalize higher education. KIIT is a member of IAU since 2009.